Streaks of clouds mark the clear sky as our bus rolls eastward on the 210 Freeway. 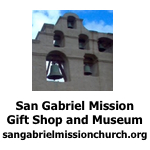 The San Gabriel Mountains stand out sharply on our left. The thousands of years of runoff from the mountains had created a vast alluvial plain of gravel and boulders which we often see from the bus. Several deep quarries are in the plain, mining the gravel and rocks to be used in construction everywhere. The soil is also good for absorbing water as a number of spreading basins conserve water rather than allow it to run off to the sea. As we move eastward we have the San Bernardino Mountains with snow-streaked San Gorgonio Peak off to our left. By the time we leave Beaumont vegetation is sparser and dryer as we enter the edge of the desert climate. We soon are in the midst of over three thousand windmills, each one of them generating electricity to join the grid that supplies homes and businesses all over the area. The turning of all those windmills utilizing the natural wind funneling through the Banning Pass makes us a little bit dizzy. Out into the desert on Interstate 10 we see the Little San Bernardino Mountains ahead of us. We turn into them on Highway 62, known as the 29 Palms Highway which will lead us to the entrance to Joshua Tree National Park. We pass through a series of barren rocky hills and plains of olive-green creosote bushes until we reach the town of Yucca Valley, a surprisingly large town with many of the major stores and restaurants as well as housing developments. At 29 Palms we finally enter the park at the Oasis Visitor Center. We spend time there looking at the exhibits that explain the geology of the park as well as its flora and fauna. We break for a box lunch and a little relaxation, then look out over a nature trail and the arid mountains beyond. Once on our way, we head south in the park, all the time gaining in altitude. A remarkable feature of the park is that it is the meeting place of the Mojave Desert, a high desert, and the Sonora Desert, a lower, drier one. Each is accompanied with its special types of plants. At first we travel through an area more like the Sonora Desert with creosote bushes, some with yellow blossoms and cholla cactus, a fuzzy looking cactus with its branches covered with spines. At a distance the cholla looks innocent, as though one could “pet” it, but that would be a great mistake as the barbed spines easily enter flesh but are very difficult to remove. 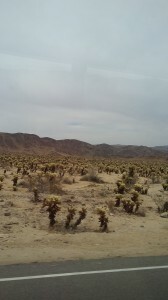 Gazing out of the bus window, we also spot low growing yucca plants and the smoke tree that grows in sandy washes and, from a distance, looks like, with its gray foliage, a puff of smoke. Here and there along the road grow palo verde trees, a leafless tree, its branches and trunk bright green. Around each horizon stand rocky mountains, roughly colored like chocolate or cocoa. The scene is one of arid beauty and wide spaces. As we reach the higher ground we begin to see a few Joshua trees, a tree named by the Mormon pioneers, thinking its branches that, like arms, appear to be reaching toward heaven. The trees increase in number as we move on, finally becoming a Joshua forest or woodland. When we have gone as high as we can go, low, dark juniper trees grow among them as well as a few pinion pines, famous for their nuts. . At Keyes View at an altitude of just over five thousand feet, we get off the bus for the view that the point affords. A fierce, cold wind blows over the point, some of the higher gusts buffeting us and making walking difficult. The more hardy members of our group walk even higher for an unobstructed view of the Coachella Valley and Salton Sea beyond. A light haze prevented a perfect view. From here we travel to the area that Joshua Tree National Park is most noted for, the grand outcroppings of granite, smoothed and fashioned by years of wind and rain. The great boulders appear to be piled on top of each other in many unusual shapes. From a distance their texture looks almost elephantine. We stop first at Cap Rock, a huge monolith topped by what looks like a small stone cap. A most amazing sight is that of a woman climbing the huge rock without equipment except for a long rope that she could grab in an emergency. She struggled as she climbed, looking for the proper spots to place her hands and feet. I’m concerned that she might fall right before us. At last she rappels down hanging on to the rope and using her feet to keep her distance from the rock. Dolores and I touch the rock, feeling its graininess. On our way out of the vast park we stop one more time at another most amazing sight, the Cholla Cactus Garden. A “forest” of Bigalow cholla cactus, locally called Teddy Bear Cholla grows close together as far as the eye can see. These have not been planted as the term “garden” might imply, the whole array of these cacti is perfectly natural. The spines have a yellowish color. Little balls covered with spines break off and are scattered among the cholla and will develop later into another plant. After this stop, we are essentially on our way home with our heads full of all the beauty and magnificent scenery that we had absorbed during the day. 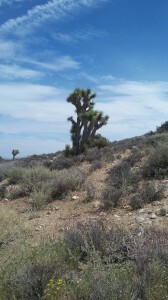 The Joshua Tree gives the park its name. This one stands out against the pure blue of the park's sky. This large outcropping is called Cap Rock. 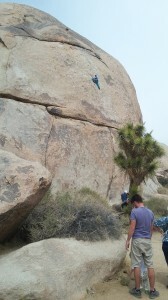 Note the climber scaling the rock without equipment. 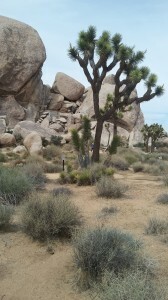 The photo captures the essence of Joshua Tree National Park--the marvelous granite outcroppings and the Joshua Tree. This extensive display of cholla cactus, called "Teddybear Cactus" looks as though it were planted.